Chronic back pain affects eight out of ten people, and practicing back safety at work prevents issues from becoming worse. Planning ahead, getting help, and working "smart" prevent back injuries from occurring on the job. Workers' Compensation and health insurance claims add expenses to the company budget. Your body is most vulnerable when you have not moved for extended periods of time, such as when you get to your work site. Plan ahead for your workday by sleeping for eight hours and waking up refreshed. Take frequent breaks throughout the day, moving around the office to prevent fatigue. Your body is vulnerable when your system is malnourished, which includes lack of sleep. Practice a healthy lifestyle by eating healthful foods regularly; drinking lots of water, and getting one hour of moderate exercise per day. Consider stretching and exercising before you go to work to reduce the strain on your back muscles. Minimize the amount of time you are on the floor carrying items, have the items delivered to your workspace or utilize a handcart or dolly, even for seemingly lightweight items. While the weight of the object is a factor, bending over excessively can cause back problems. Consider adjusting your office so that everything is waist level, including your desk and computer. These are the items you use most, reducing the amount of time your back extends in either direction. Practice good posture and ensure your chair adjusts properly when using computer equipment or sitting in a meeting. Ergonomic equipment is desirable, but few employers are able to spend the extra money. Consider buying your own back-friendly chair at work if you sit for hours at a time. Prevent work-related back injuries by ensuring your working conditions are free of debris and slippery spots. Slips and fall injuries cause most back pain problems in America. Chances are your workplace has assistive equipment available for you to use, such as forklifts, handcarts, dollies, hoists, furniture pads, shoulder straps, and wheelbarrows. Use the equipment you have to reduce the strain on your back and hip muscles. If you do not have assistive equipment available and you perform the job often, ask your employer to buy the equipment for your office. Ask a colleague, coworker, or someone from the warehouse to help you move heavy office appliances or equipment. Get help move the materials if they weigh over 50 pounds. When you are, lifting or moving objects, keep them as close to your body as possible, creating a low center of gravity. Do not twist your extremities when you lift or put down materials, turn your entire body at once. 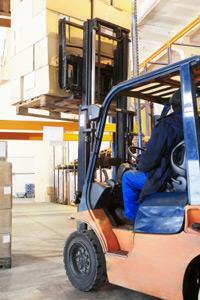 Improve back safety at work by lifting materials smoothly and using your legs rather than back muscles for strength. Rough jerking motions irritate your upper and lower disks, causing soreness the next day. If you need support when lifting, lean on a sturdy object and do not bend over. If the item is too heavy, kneel down and support the object on your knee before you lift it. Ask someone to help you if the item is too heavy. There is a difference between being lazy and working smart. Everyone is afraid of appearing weak in front of their employers, but practicing proper back prevention techniques is an intelligent move. If you miss work for one or two days, your employer may incur additional costs, such as hiring a temp worker or paying sick leave. If you have existed back conditions, abide by the restrictions posted by your doctor. An employer cannot legally require you to perform labor you are incapable of doing. By law, they must adjust your regimen or reassign your duties until you receive clearance. If you encounter back problems on the job seek immediate medical attention and follow your company's policy on work-related injuries. When joining an employer, file a form with the company's Workers' Compensation Liaison requesting to see your private physician in case of work injuries. If you must see a "company approved" medical practitioner, seek a second opinion if the ruling is on the company's behalf.